Cyperus is a large genus of about 700 species of sedges, distributed throughout all continents in both tropical and temperate regions. They are annual or perennial plants, mostly aquatic and growing in still or slow-moving water up to 0.5 m deep. The species vary greatly in size, with small species only 5 cm tall, while others can reach 5 m in height. Common names include papyrus sedges, flatsedges, nutsedges, umbrella-sedges and galingales. 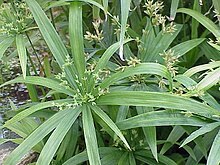 The stems are circular in cross-section in some, triangular in others, usually leafless for most of their length, with the slender grass-like leaves at the base of the plant, and in a whorl at the apex of the flowering stems. The flowers are greenish and wind-pollinated; they are produced in clusters among the apical leaves. The seed is a small nutlet. Cyperus species are eaten by the larvae of some Lepidoptera species, including Batrachedra cuniculata. They also provide an alternative food source for Bicyclus anynana larvae. The seeds and tubers are an important food for many small birds and mammals. Cyperus microcristatus (from Cameroon) and C. multifolius (native to Panama and Ecuador) are possibly extinct; the former was only found once, in 1995, and the latter has not been seen in the last 200 years. The "true" papyrus sedge of Ancient Egypt, C. papyrus subsp. hadidii, is also very rare today due to draining of its wetland habitat; feared extinct in the mid-20th century, it is still found at a few sites in the Wadi El Natrun region and northern Sudan. Some tuber-bearing species on the other hand, most significantly the purple nutsedge, C. rotundus, are considered invasive weeds in much of the world. Around 700 species are currently recognised in the genus Cyperus. Many fossil fruits of a Cyperus species have been described from middle Miocene strata of the Fasterholt area near Silkeborg in Central Jutland, Denmark. Several fossil fruits of †Cyperus distachyoformis have been extracted from borehole samples of the Middle Miocene fresh water deposits in Nowy Sacz Basin, West Carpathians, Poland. Papyrus sedge (C. papyrus) of Africa was of major historical importance in providing papyrus. C. giganteus, locally known as cañita, is used by the Yokot'an Maya of Tabasco, Mexico, for weaving petates (sleeping mats) and sombreros. C. textilis and C. pangorei are traditionally used to produce the typical mats of Palakkad in India, and the makaloa mats of Niihau were made from C. laevigatus. Priprioca (C. articulatus) is one of the traditional spices of the Amazon region and its reddish essential oil is used commercially both by the cosmetic industry, and increasingly as a flavoring for food. Interest is increasing in the larger, fast-growing species as crops for paper and biofuel production. Some Cyperus species are used in folk medicine. Roots of Near East species were a component of kyphi, a medical incense of Ancient Egypt. Tubers of C. rotundus (purple nut-sedge) tubers are used in kampō. An unspecified Cyperus is mentioned as an abortifacient in the 11th-century poem De viribus herbarum. Amphoe Nong Prue, a district in Thailand. The name of its capital Nong Prue (หนองปรือ) literally means "Cyperus swamp". The sedge Carex pseudocyperus is a related plant convergent in appearance to Cyperus. ^ a b "Cyperus L., Sp. Pl. : 44 (1753)". Kew World Checklist of Selected Plant Families. Royal Botanic Gardens, Kew. Retrieved 22 March 2015. ^ Win Huygh; Isabel Larridon; Marc Reynders; A. Muthama Muasya; Rafaël H. A. Govaerts; David A. Simpson; Paul Goetghebeur (2010). "Nomenclature and typification of names of genera and subdivisions of genera in Cypereae (Cyperaceae): 1. Names of genera in the Cyperus clade". Taxon. 59 (6): 1883–1890. doi:10.1002/tax.596021. ^ Gordon C. Tucker; Brian G. Marcks; J. Richard Carter (2003). "Cyperus Linnaeus, Sp. Pl. 1: 44. 1753; Gen. Pl. ed. 5, 26. 1754". In Flora of North Americaial Committee. Magnoliophyta: Commelinidae (in part): Cyperaceae. Flora of North America. 23. Oxford University Press. pp. 141–191. ^ C. D. Adams (1994). "5. Cyperus L.". In G. Davidse; M. Sousa Sánchez; A. O. Chater. Flora Mesoamericana. 6. Mexico City: Universidad Nacional Autónoma de México. pp. 423–440. ^ Rinny E. Kooi; Paul M. Brakefield; William E. M.-T. Rossie (1996). "Effects of food plant on phenotypic plasticity in the tropical butterfly Bicyclus anynana". Entomologia Experimentalis et Applicata. 80: 149–151. doi:10.1111/j.1570-7458.1996.tb00906.x. ^ "Cyperus". The Plant List. Retrieved 20 March 2015. ^ Łańcucka-Środoniowa M.: Macroscopic plant remains from the freshwater Miocene of the Nowy Sącz Basin (West Carpathians, Poland) [Szczątki makroskopowe roślin z miocenu słodkowodnego Kotliny Sądeckiej (Karpaty Zachodnie, Polska)]. Acta Palaeobotanica 1979 20 (1): 3-117. ^ Hittman, Michael (1996). Corbett Mack: The Life of a Northern Paiute. U of Nebraska Press. pp. 274–275. ISBN 9780803223769. ^ Atala, A. (2012). "A new ingredient: The introduction of priprioca in gastronomy". International Journal of Gastronomy and Food Science. 1: 61–81. doi:10.1016/j.ijgfs.2011.11.001. ^ Natura. "Perfumes baseados em Priprioca". Archived from the original on 2009-04-03. ^ Brickell, Christopher, ed. (2008). The Royal Horticultural Society A-Z Encyclopedia of Garden Plants. United Kingdom: Dorling Kindersley. p. 302. ISBN 9781405332965. ^ John M. Riddle (1994). Contraception and Abortion from the Ancient World to the Renaissance. Cambridge, Massachusetts: Harvard University Press. ISBN 978-0674168763. Wikimedia Commons has media related to Cyperus.